How to reduce/eliminate joint pain and grow strong hair and nails! I have received a few emails asking about how I learned about Hydrolyzed Collagen in the first place and what is the quality of the Fit Moms Hydrolyzed Collagen, specifically. Six years ago, when Tracie Fountain, our incredible nutritional counselor, mentioned “hydrolyzed gelatin (or collagen) I said, “SAY WHAT?” I had never heard of it before, let alone know what it actually did. But Tracie is one smart woman and had been seeing incredible results in her clients’ lives for many years. So over the course of the past 6 years, hydrolyzed gelatin has become a staple of all our menus and eating plans that my clients receive and the stories shared have been incredible. About 18 months ago, I started to ask the question, would it be possible for Fit Moms for Life to have its own brand of collagen? As I began to research where it came from and how it is created, the path to getting our own seemed nearly impossible. Since there are only a couple companies in the world that source this, it came down to a lot of hard work, persistence and a little luck. Each serving contains only 40 calories, 100% of that coming in the form of protein. If you have specific questions about it, feel free to email me at dustinmaherfitness@gmail.com and I will do my best to answer them. I was in my office in the back of the Transformation Center, when a client came in excited. She told me she saw my car out front and thought I might be around. “My 76 year old mom LOVES you and can’t stop talking about you!” she exclaimed. I was confused, I had never met her mom from Indiana before, and I can’t say I have had many 76 year olds confessing their love towards me. “Why?” I asked. My client explained, “We gave her the Fit Moms Hydrolyzed Collagen 4 weeks ago, and her chronic knee pain is totally gone. She could hardly walk up stairs and when she did it was very painful, but now she is pain free. She can’t stop talking about it and how happy she is.” I smiled and told her I am so happy to hear that. Almost everyday I hear a story like this. Joint pain is dramatically reduced, hair grows stronger, nails get thicker, hunger pains subside, weight loss occurs, and sometimes skin tone improves. Since launching our own hydrolyzed collagen a little bit ago, over 1,000 clients have seen the benefits of it and made it part of their daily routine to add to their coffee, tea, yogurt, smoothie, soups, baked goods and much more. Free shipping for prime members! Be on the lookout for another blog post with one of my FAVORITE recipes using the collagen, so simple, yet healthy and yummy. 3 More Ways to Eat Cookies for Breakfast, plus special launch pricing ends tomorrow! It’s Dustin and I’ve had so many people tell me that they enjoyed the hydrolyzed collagen recipes that I decided to send out one more set (below) before we officially end our collagen “launch” tomorrow. I hope you enjoy these additional ways to eat (healthy) cookies for breakfast! As a reminder, when you order your hydrolyzed collagen from us on Amazon, you’ll receive an awesome digital Hydrolyzed Collagen Cookbook. The URL to download the cookbook is right on the bottle. I included one of my favorite recipes from the cookbook below. The full cookbook includes a variety of breakfasts, smoothies, soups, main dishes, and even desserts. The recipes are simple and delicious and will help you learn how to incorporate hydrolyzed collagen into your diet every day. Our launch special pricing is good through tomorrow—enter the code FM4LVIPS to get $8 off your bottle. But don’t wait! We have less than 200 bottles in stock right now and they will go quickly with the discount ending. If you missed our introduction to collagen, learn more about this anti-aging, anti-inflammatory “miracle protein” in this video. Blend all ingredients together and pour into 24 mini-muffin tins lightly greased with coconut oil. Bake for 20-25 minutes or until set and lightly browned on top. Cool, top with fresh berries and serve. In a large bowl, mix mashed banana & nut butter until completely combined then add in the applesauce, collagen & vanilla ~ mix again until all are completely combined. Add in the oatmeal, nuts and chocolate chips to the banana mixture & combine. Let dough rest for 10 minutes. Drop cookie dough, by spoonfuls, onto a parchment paper lined cookie sheet & flatten cookies into circles. Bake cookies approx. 20-30 minutes (some like their cookies less cooked, some cooked more – try it both ways to find which works best for your tastes) or until golden brown & done. Remove from oven & let rest on cookie sheet for 5 minutes, then move to cooling rack. Preheat oven to 350°. Blend bananas, collagen, coconut oil, maple syrup and vanilla. Stir in oats, coconut, salt, pecans, and blueberries until well combined. Press 2 tablespoons of mixture into a 2½­inch round cookie cutter onto a baking sheet lined with parchment paper. Continue with remaining mixture. There is one thing I eat every single day. It satisfies my hunger and keeps my knees feeling great, despite all of the stair-climbing I am doing these days. I definitely notice and miss it if I skip a day. That one thing is collagen tea. Right now you might be thinking that sounds crazy. But it is delicious and a very easy way to get my collagen in every day. Click here (or below) to join me in my kitchen for a demo of how I make my tea. 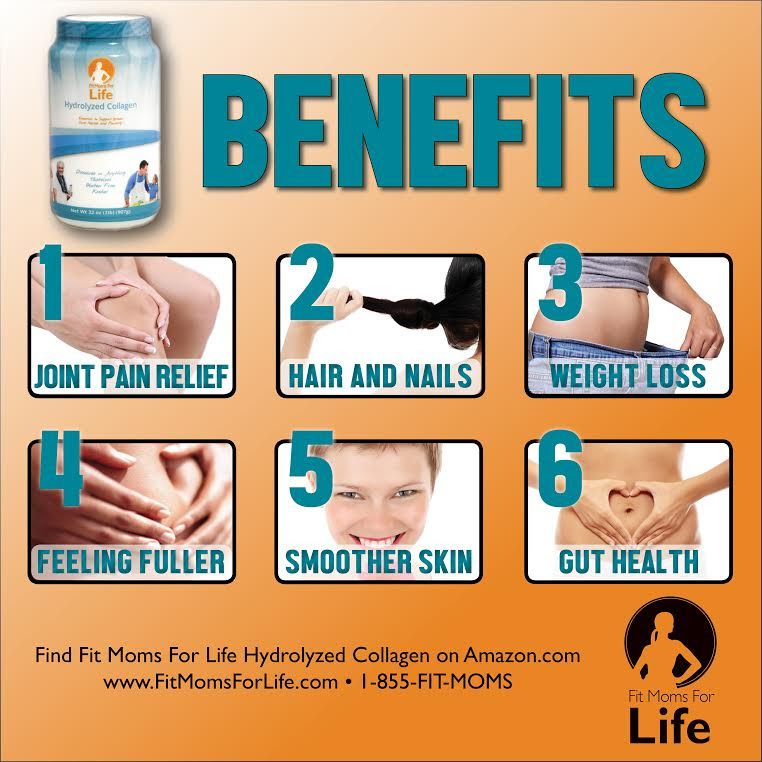 Fit Moms for Life Hydrolyzed Collagen is available on Amazon! Grab your bottle now, while our discount code is still good. We will be discontinuing our launch discount on Friday. → Click here to purchase on Amazon now. ← Enter the code FM4LVIPS for $8 off. Don’t wait, because this code will be good only until Friday! Watch for my next blog post with a few more healthy treat recipes. The cookie recipes were so popular that we decided to send you a few additional recipes! 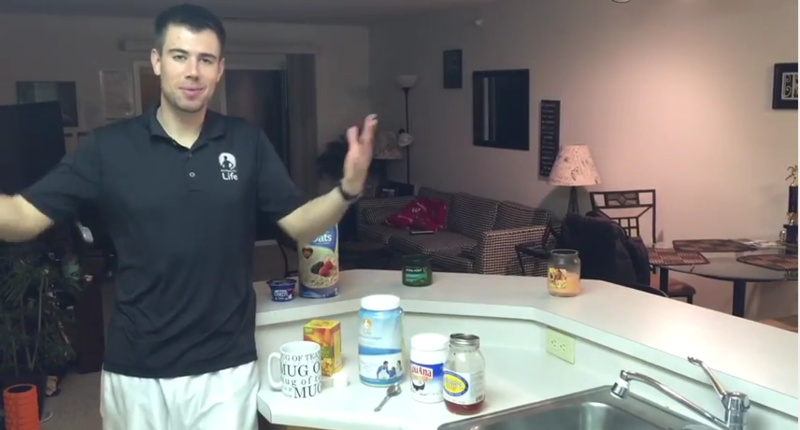 Watch this video as I share with you from my kitchen one of my favorite ways to drink tea. Click here to grab your 2 lb container of Hydrolyzed Collagen at Amazon. Yup, with the right balance of protein, healthy fats and carbohydrates, you won’t have to feel guilty about feeding your kids either of the delicious recipes below, even for breakfast! The key is the protein, and hydrolyzed collagen is what helps give both of these recipes a huge, healthy protein boost. Give your kids these over Nutella any day! 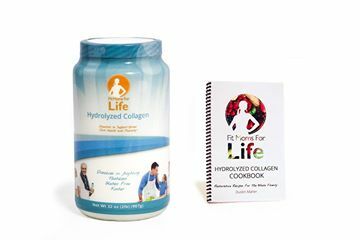 Our FM4L Hydrolyzed Collagen is back in stock for now. Grab yours on Amazon here, and use the code FM4LVIPS for $8 off. 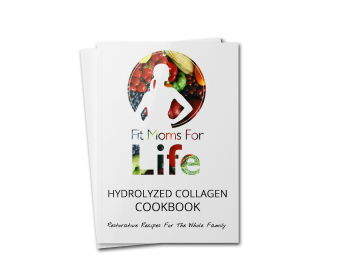 And don’t forget to download the FM4L Hydrolyzed Collagen cookbook, using the URL on the bottle. It contains lots more delicious recipes! I only ask that you leave a review after you use it and, hopefully, love it. Stay tuned—later this week I’ll share a quick video from my home on how I use collagen every day. Preheat oven to 350 degrees (F) and line 2 large baking sheets with parchment paper or silicone liners. Using an electric mixer, cream the almond butter, sugar, maple syrup, and vanilla. Beat in the egg. Beat in the collagen, baking soda and sea salt, and then stir in all other remaining ingredients. Roll the dough by heaping tablespoon into balls and place them on the baking sheets spaced about 3 inches apart. Using the tips of your fingers, gently flatten the dough until it is about 1/2 an inch thick. Bake for 12 to 14 minutes, or until the cookies are turning golden brown at the edges. Leave cookies on the baking sheet to cool. Store the cookies uncovered out on the counter (so the air can get to them). They will crunch up on the outside, but still remain soft on the inside. If you store them in an airtight container, they will retain too much moisture and crumble easily. Place quick oats in a food processor and blend until consistency is that of flour. Place almond or peanut butter in a medium-sized bowl. One tablespoon at a time, sprinkle small amounts of the gelatin over the top and stir for several minutes until dissolved. Add processed quick oats and honey and stir until combined. Add chocolate chips, and using your hands, combine mixture thoroughly. Form into 1-inch balls. Place on a small cookie sheet or plate and refrigerate for 30 minutes prior to serving. *Note: Make sure to use natural almond or peanut butter that requires you to mix in the standing oil at the top for this recipe. It should be stirred well and not oily prior to using or the balls will have difficulty staying together. ThePeanut Butter Ball recipe is courtesy of Tracie Fountain, who has provided FM4L with excellent nutritional advice for years. Tracie has just released an outstanding new cookbook, which contains a number of collagen recipes. All of the recipes are designed to help balance blood sugar and are based on whole foods. You can check out both of her cookbooks by clicking here. Can Protein Powders Be Harmful? I hope you’ve enjoyed learning a little more about this truly amazing protein—hydrolyzed collagen—over the past few days, and maybe even tried some of our recipes! If you missed our videos, check them out here. Find our hydrolyzed collagen on Amazon here. I’ve been getting some questions about it via email, so I thought I’d take a moment to answer a few of them here. Can collagen replace whey or other protein powders? Many have asked if hydrolyzed collagen is a replacement for whey protein powder. The answer is absolutely yes. Like whey protein, hydrolyzed collagen is easily absorbed and utilized by the body, making it a perfect post-workout protein. In fact, many people use collagen instead of whey because it is a cleaner, less processed source of protein. While I do not claim to be an expert on this, there has been some negative publicity about whey protein powders, highlighting questions about quality and purity. Many of these powders are processed and packaged in China, and a 2010 Consumer Reports analysis and 2013 and 2015 ConsumerLab.com analyses found potential contamination issues (heavy metals, arsenic) in 20-20% of the samples tested. You can read more about this here, here and here if you want. I do believe that there are safe, high quality, whey protein powders and, in general, whey is a great, easily absorbed protein if you can tolerate dairy. But some people are choosing to avoid the potential risk completely by switching over to hydrolyzed collagen or some other single source protein (hemp hearts, pea protein, etc). The other major and noticeable difference between whey protein and hydrolyzed collagen is that collagen does not have a flavor. Some protein powders can be chalky tasting and require a lot of sweetener to make them palatable. Hydrolyzed collagen does not change the taste or texture of things and has no added sugar (or any other ingredient). How much should I use and how quickly will I see results? We recommend 2 scoops per day—1 in the morning and 1 in the evening—for the best results. You should notice a difference in 4-6 weeks. Can I use it in a meal-replacement shake? Yes—the protein will help you feel full longer and will balance your blood sugar. Just make sure that, if you are making a meal-replacement smoothie/shake, you include healthy fats along with the collagen protein and the carbs (fruit, vegetables etc). You can use a nut butter, avocado, coconut oil, or even chia seeds. Including a healthy fat will balance the meal and keep you satisfied. Click here to order our Hydrolyzed Collagen on Amazon, and use the code FM4LVIPS for $8 off! I still think back to when Tracie Fountain introduced me to this product. I was so skeptical, but I cannot get over the difference it has made for me and just about all of my clients who use it. Every day I hear from people who can walk up and down stairs without pain; who no longer suffer cravings because they’ve managed to balance their blood sugar; who are no longer hungry all of the time because they’ve increased their protein consumption. Can you take too much of it–is too much bad for you? No. Because hydrolyzed collagen has no other ingredients and is simply protein from pastured cattle, there is no toxic amount. You cannot “overdose” on collagen. Click here to order this miracle protein now! Use the code FM4LVIPS for $8 off, during our launch only. As a reminder, you may see our brand new foam roller on Amazon—click here to check it out. We haven’t officially launched that yet, but if you are interested, don’t buy without using the code FM4LLOVE to get $15 off!